A DJ, filmmaker and musician, Don Letts was one of the first to bring dub and reggae to the London punk scene, with his sets at punk venue The Roxy Club bridging the gap between punk and dub, introducing a new generation of fans to Jamaican music. 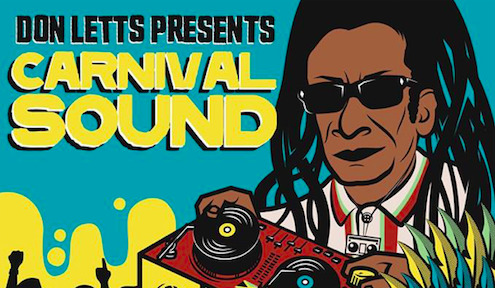 Don Letts is taking his legendary Notting Hill Carnival set on tour with Carnival Sounds. A riot of multi-cultural sound that crosses borders and genres, spanning everything from good-time funk and golden-era hip hop to jump-up jungle, dancehall and reggae, his Carnival Sound is guaranteed to get hands up and heads down, a true celebration of the good times. A legendary Birmingham DJ, Sam Redmore is well known for having his finger on the funk and soul pulse. Both a record producer and DJ, Sam is takinghis iconic Tropical Soundclash set on tour, hitting the whole country with a heavy dose of funk. Tickets £8 early bird, £10 standard advance, more on the door.